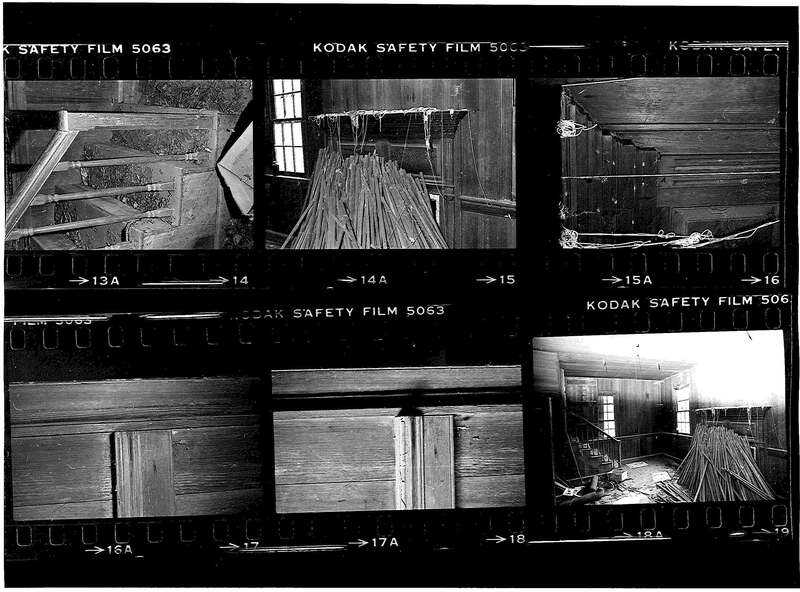 Iredell County | Scuffalong: Genealogy. 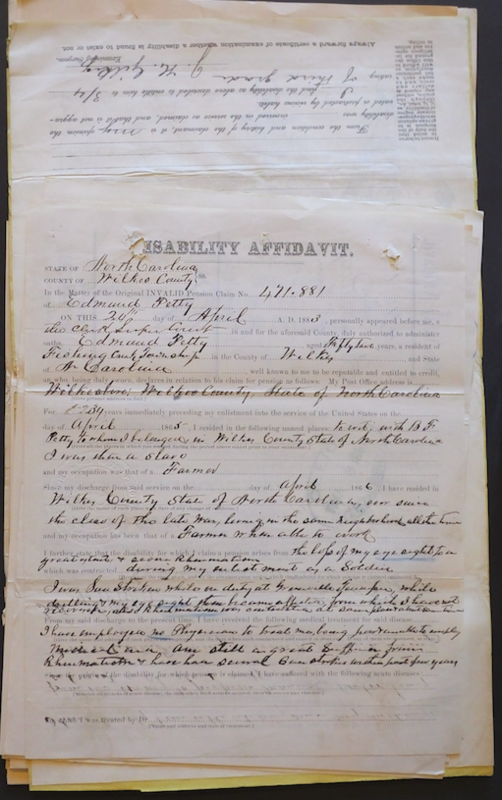 Iredell County – Scuffalong: Genealogy. DNA Definites, no. 24: Nicholson. Two more Nicholson matches at Ancestry DNA. The first is with T.L. His ancestor Moses P. Nicholson migrated to Indiana in the 1830s, long before my great-great-grandmother Harriet Nicholson was born. T.L. has no other Iredell County lines, underscoring the unlikelihood that our match is through some other line. The second is R.H., who also matches T.L. 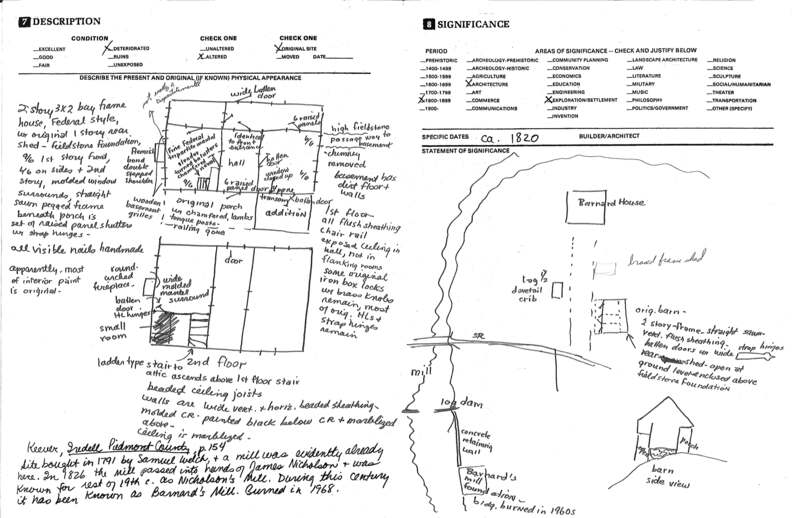 R.H. is descended from a first-cousin marriage between grandchildren of both of John S. Nicholson‘s wives, as am I. Unfortunately, Ancestry has a hard time interpreting matching trees that involve multiple spouses and fathers and sons with the same names, and these charts are not quite right. John McNeely vs. John McNeely. Okay, now I am genuinely perplexed. A couple of months ago, I wrote about finding my great-great-uncle John McNeely’s first wife, whom he married in 1899. 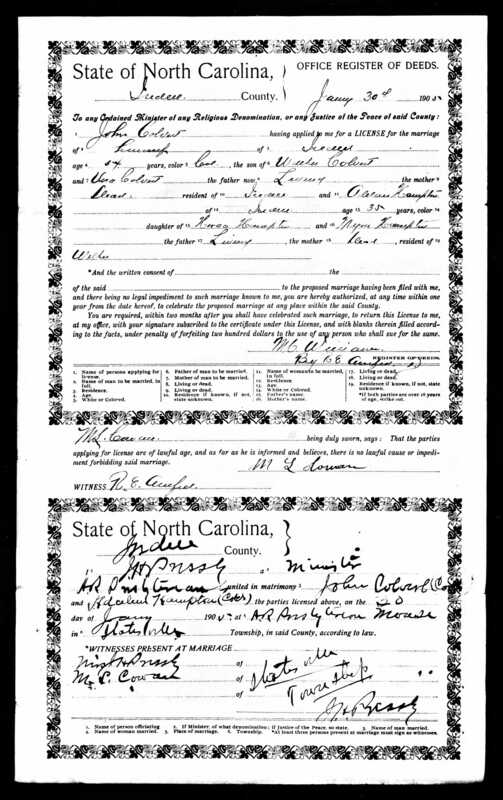 I had just found a marriage license for John Alexander McNeely, colored, son of Henry and Martha McNeely of Iredell County, and Carry Armstrong. Prior to this, I had only known wife Laura Nesbit, whom he married in Statesville in 1912. So yesterday when I found yet another marriage for John A. McNeely, son of Henry and Martha McNeely of Iredell County, I was flummoxed. Did John marry Laura, divorce (or otherwise leave) her, marry Jane Nichols, divorce her, then remarry Laura Nesbit? If so, where is the second marriage license for Laura? If not, who is this John McNeely? And who are the other Henry and Martha McNeely? 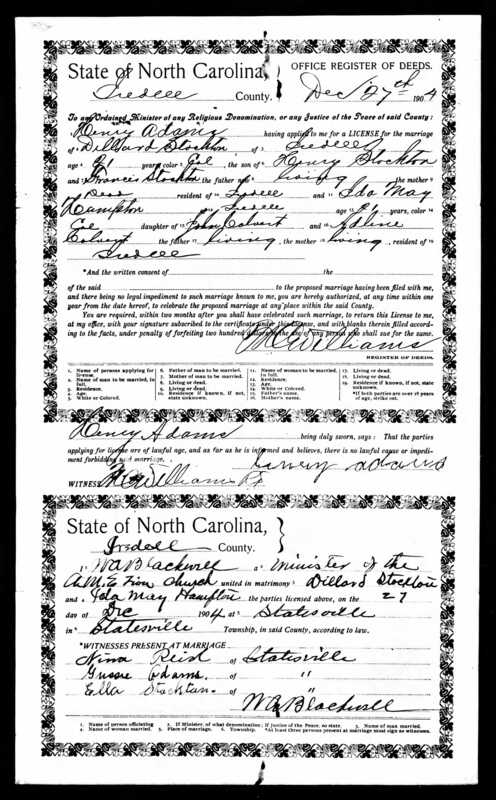 The only Henry and Martha McNeely in the 1900 census of North Carolina are my John’s parents, living in Statesville township. In 1880, they’re in Rowan County, and still the only couple with those names in the state. 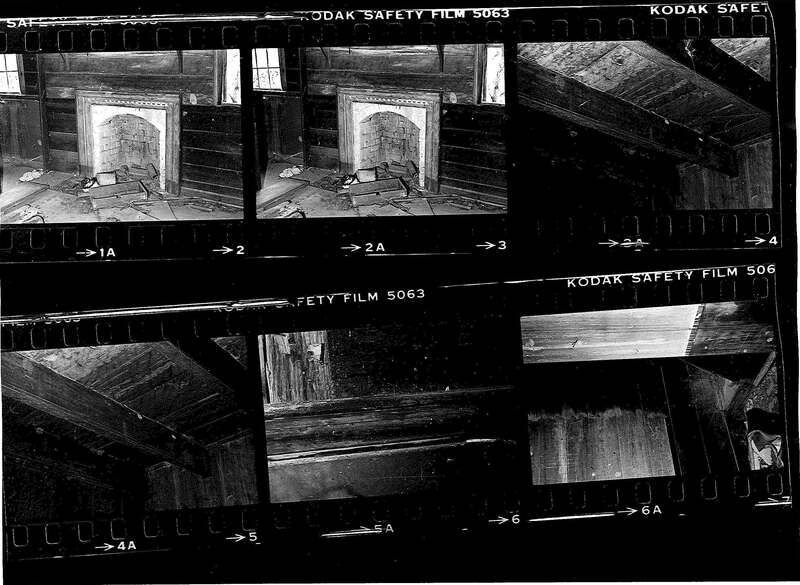 Henry died in 1906, before death certificates were kept, and Martha died in New Jersey. 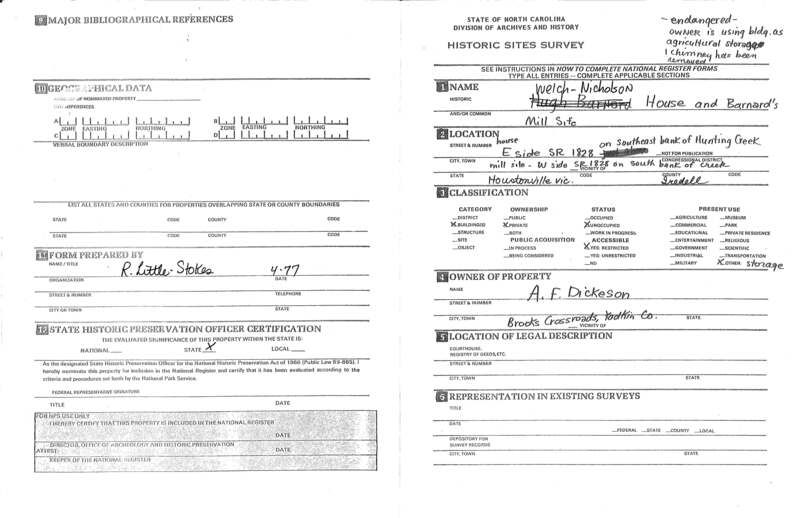 I have not found death certificates for any other Henry or Martha McNeely in Iredell. As for John: John and Jane McNeely appear in the 1900 census of Statesville, my John McNeely does not. In the first decade of the century, a John McNeely pops up in the pages of the local paper for various misdeeds — shooting at a rival, having smallpox, fighting, slicing a man with a knife, shooting at a dog. I’d like to think that this is not my John, but there’s no clear way to know. And there’s no John McNeely at all in Iredell County in the 1910 census. I’ll have to leave it here for now. I don’t have enough to know for certain whether John McNeely and John Alexander McNeely were the same man. 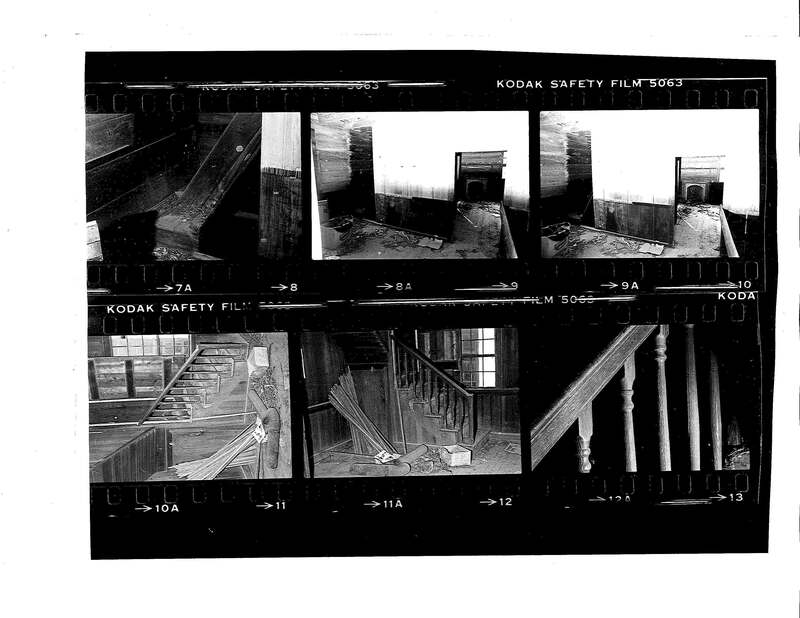 UPDATE, 19 June 2015: Is this a clue to the identity of John A. McNeely? This Henry McNeely is not my great-great-grandfather Henry McNeely. He’s his nephew. Henry’s father John Rufus McNeely was, I believe, the half-brother of my Henry. Unfortunately, this Henry was born about 1863, and John A. McNeely was born about 1870. I don’t believe this Henry and Martha were the couple named on John A. McNeely’s marriage licenses. UPDATE, 21 June 2015: Then there’s this. 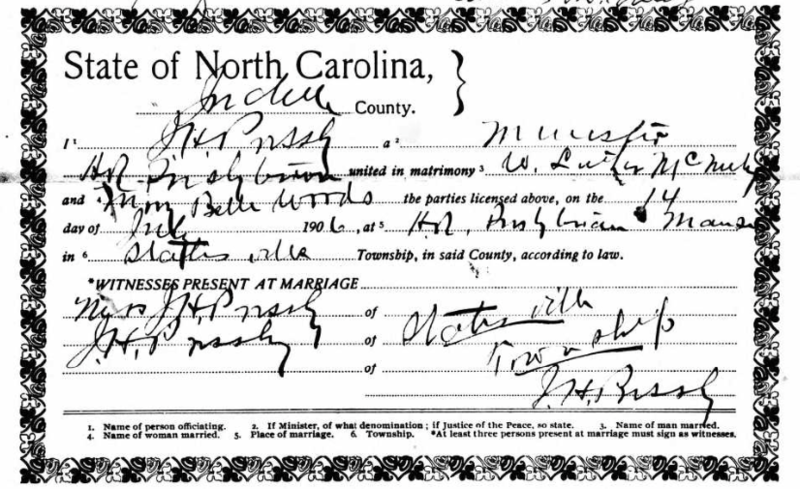 This is from the marriage license of my John McNeely’s brother, William Luther McNeely, who married Mary Belle Woods in 1906 at Statesville’s Associate Reform Presbyterian Church. My great-grandparents Lon and Carrie McNeely Colvert wed there the same year. Is it just coincidence that John Alexander McNeely was also married by Rev. J.H. Pressly in this church? Ancestry.com’s North Carolina Marriages data collection is not through demystifying my kin. 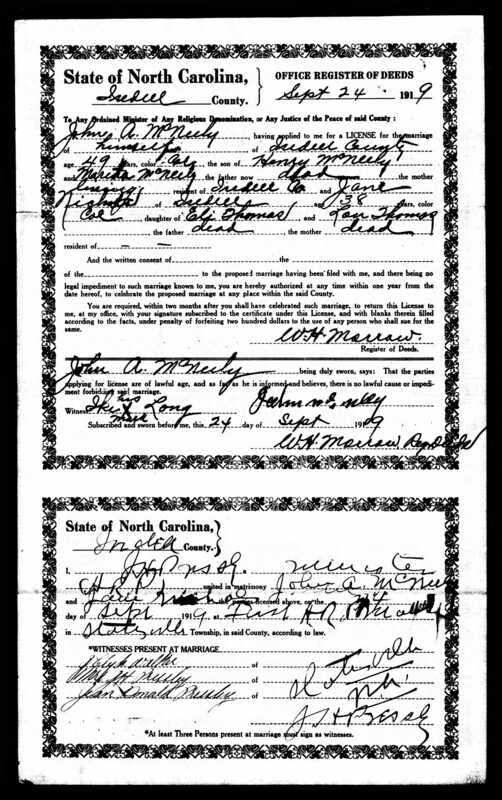 A previously unknown marriage license clarified a question I had my great-great-aunt Ida’s life. If Eugene Stockton were her husband, I wondered here, why was she a Stockton in the 1910 and 1920 censuses, but referred to as his sister-in-law? In gaining an answer, I also uncovered a terrible tragedy. 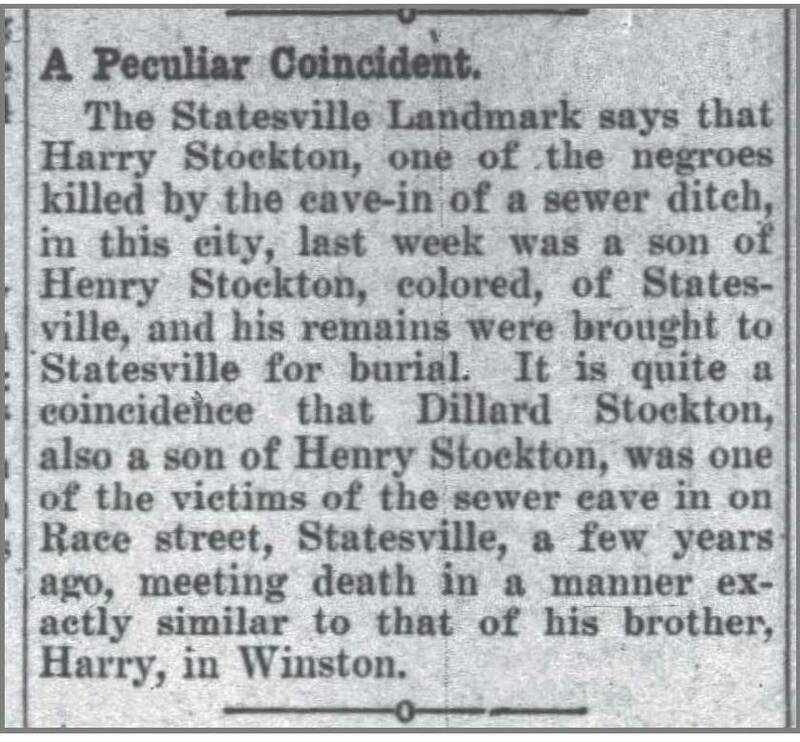 Statesville Record & Landmark, 12 March 1907. 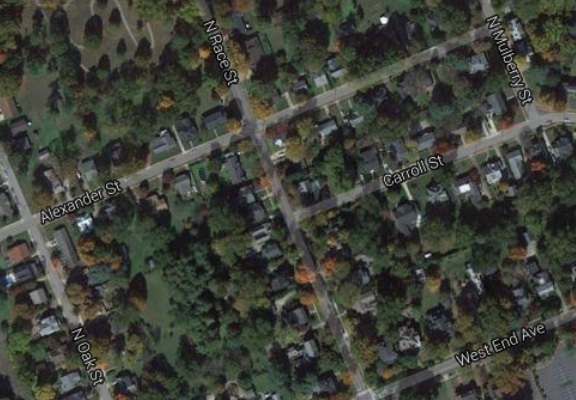 The stretch of Race Street in which the cave-in occurred. 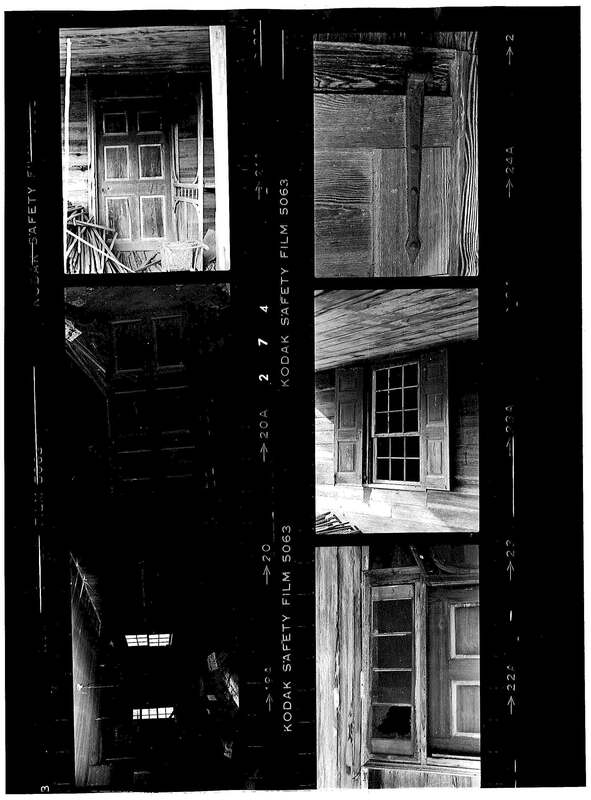 For all the breathless detail of the initial report of the tragedy, greater Statesville soon moved on. 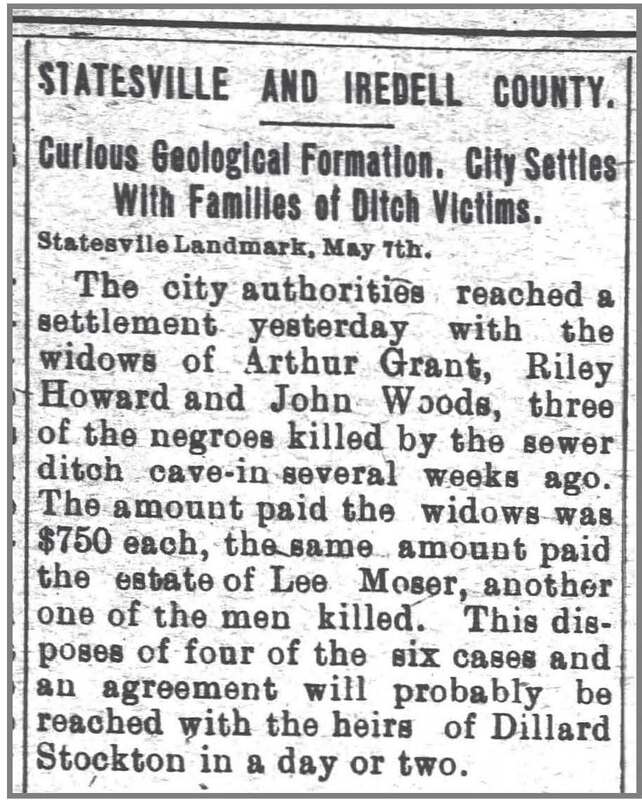 As reported in the local paper, within two months, the city had settled four of the deaths with payments of $750 (roughly $19,000 today) and were close to settling with the remaining survivors, including Ida May Colvert. 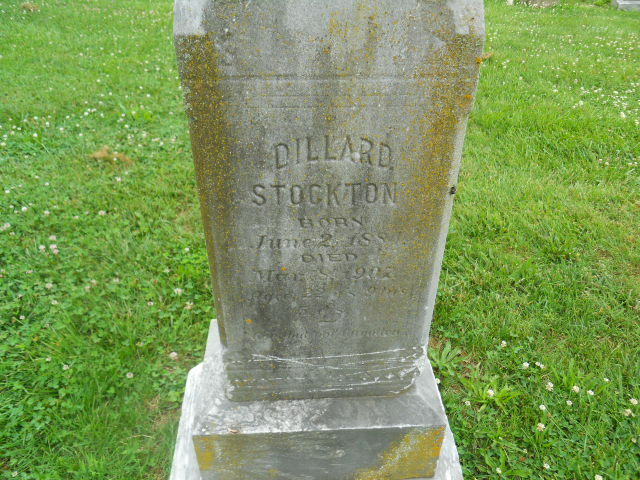 Dillard Stockton is buried in Statesville’s Green Street/Union Grove cemetery. I snagged this photo from findagrave.com. 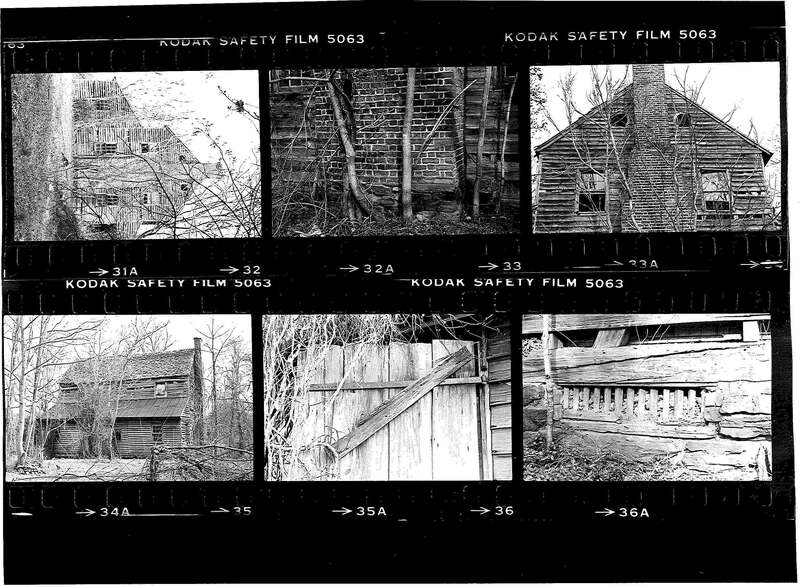 I don’t recall seeing it during my recent visit and don’t know if it’s near the Colvert graves. 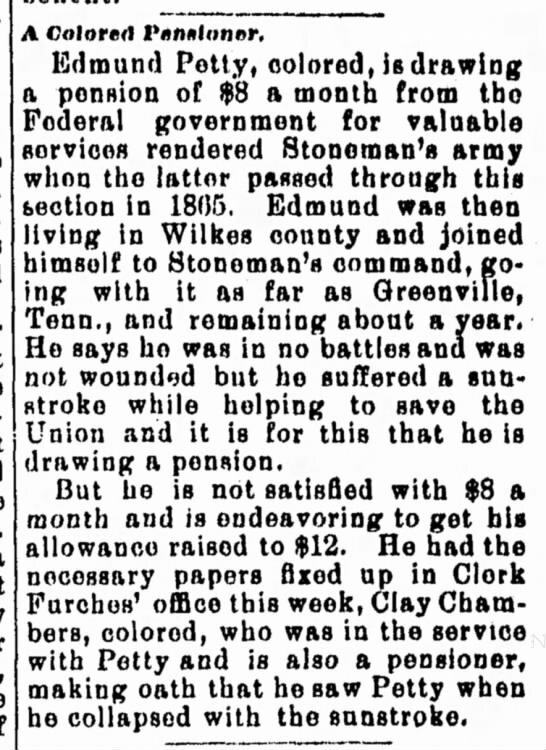 Winston-Salem Union Republican, 12 May 1912. I knew Rebecca Colvert was my great-great-grandfather John W. Colvert‘s stepmother. Until now, though, I’d seen his mother Elvira Gray‘s name listed only on his death certificate. On 30 January 1905, six days before his father Walker‘s death, John married Adeline Hampton, mother of his four daughters. I’d seen the marriage register entry for their union, but not the actual license. Here it is, and there is the second reference to Walker’s first wife.